The NCAH qualification enables animal medicines representatives to provide support to the prescribers and sellers of animal medicines they visit. It provides a solid background in animal physiology, immunology and pharmacology, nutrition and animal disease control, as well as full knowledge of the legal framework in which licensed veterinary medicines are regulated, promoted and sold. The NCAH is written into the rules for NOAH company membership, is a requirement of the NOAH Code of Practice for the Promotion of Animal Medicines and is also a requirement for non-NOAH companies who put products in the NOAH Compendium who must comply with NOAH’s Code. It is formally academically accredited by Harper Adams University, who also host both the training courses and examinations. Three sets of examinations were held in 2017, in May, July and September, with 52 students taking the exam during the year. This year for the first time three students tied in first overall place. These were: Megan Brady from Merial, Leah Craven from Nimrod Veterinary Products Ltd and Louise Good who previously worked at Zoetis. All three took their examination in the July session. 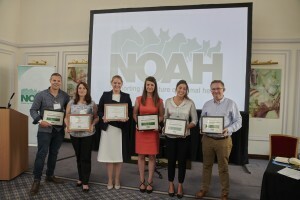 Megan and Leah attended the Members Day to accept their certificate from NOAH chair Gaynor Hillier: unfortunately Louise was unable to attend. For the May exam Nicola Nelson from Zoetis came first with three people tying for second place: Matthew Buckley from Virbac together with Emma Houghton and Kate Morris both from Elanco. 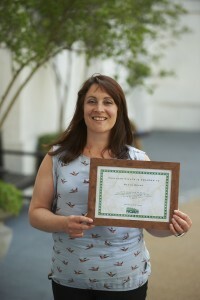 In the July exam Megan Brady from Merial, Leah Craven from Nimrod Veterinary Products Ltd and Louise Good from Zoetis tied for first place, with Sarah Wood from Vetoquinol in second. For the September exam first place went to Keira Gifford from Boehringer Ingelheim and second place went to John Newbury, previously from Merial. Megan is a Territory Manager at Merial. In 2003 Megan completed a BSc in Animal Health, after which she worked in New Zealand gaining experience in the dairy and thoroughbred racing industries. On return to the UK she took a break from the animal sector to start her own business, writing and publishing walking guides for the Lake District. Megan retrained as a vet nurse in 2008, quickly going on to be a head nurse and clinical coach for 1st opinion practice, then later to be a surgical nurse in an orthopaedic referral centre. She joined Merial in 2016 as a Territory Manager and is now happily part of the Boehringer Ingelheim Sales Team. 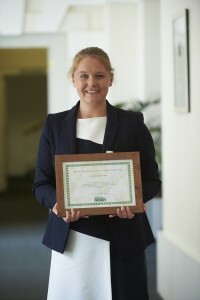 Leah is the Regional Sales Manager at Nimrod Veterinary Products Ltd. She graduated from The Royal Veterinary College in 2010 with a BSc (Hons) in Veterinary Science and worked in the financial and pet supply industries, before joining Nimrod Veterinary Products Ltd in 2014 as Territory Manager for Central England. Covering Norfolk to Wales, she spent three and a half years detailing their farm and equine equipment and pharmaceuticals to vets and farmers and enjoyed developing her relationships with their customers over this time. In November 2017, Leah was promoted to Regional Sales Manager and this has been an exciting new challenge for her, looking after national accounts, being involved in business development and supporting and training Territory Managers. Donna and David Renney, the Owners and Directors of Nimrod have been a huge support in her career so far and their work ethic, principles and business management style inspire Leah to keep developing her knowledge and skills. Leah said of the NCAH course: “The NCAH has given me a great opportunity to develop my knowledge and skills. The qualification covers such a wide range of topics across all species and the legal framework of the industry, it ensures anyone selling pharmaceuticals has increased credibility with customers and can provide good technical support”.